The answer to the riddle is an icicle. 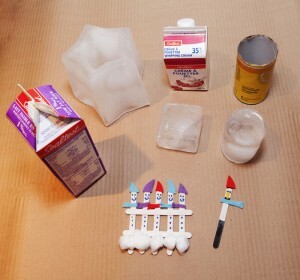 Fun winter crafts can include ice sculptures frozen in household containers, top, or snowy picket fences, bottom. We may not have had enough snow to slide and play in, but we have had enough cold for ice, and children have been having fun skating on the city rinks. Ice sculptures are another way of having fun with ice. Fill up containers large and small with water and leave out to freeze. Milk cartons and frozen juice containers can be peeled away once frozen. Adding a few drops of food colouring to the water will give colour to the sculpture, and a bit of glitter will add sparkle. Once you have all your frozen building blocks they can be stacked to make a sculpture or ice city. Pour water onto the stacked blocks so they will freeze together. This can also be done on a smaller scale using the freezer. The small ice shapes can be played with in the sink – little ones love to play with ice. Here are a few ways to make snow pictures. The simplest is to draw your picture with chalk on coloured construction paper. Or, try painting a winter scene and while the paint is still wet sprinkle it with salt and watch what happens. Little ones never tire of hand painting, so paint their hands white and leave a snowy handprint. You can also paint the bottom of their boot white and make a snowy foot print! There are many good ideas for crafts on the internet. One to check out is crafts.kaboose.com. It has a really cute snowman fence that is easy and fun to make: paint seven popsicle sticks white and assemble like a picket fence. The top of the pickets are the snowmen, so they will need hat, scarf, eyes and nose plus a few buttons. Use googly eyes or paint, and paint the nose and smile. Use a scrap of felt for a scarf and hat. You could do the same craft but make penguins. You will need some black paint. See the little penguins slip and slide. See the little penguins all fall down! If your child loves art and creating be sure to check out the Weston Family Learning Centre at the Art Gallery of Ontario. Their winter programs are starting and there are lots to choose from for younger and older children. There’s Family Fun – dropin Hands On Centre and Family Sundays, plus Kids’ Birthday Parties where guests take part in cool art activities. There are also special classes for children six to 14 years old, including painting, silkscreening and even movie making! It also has an upcoming March Break Art Camp. Find out more at www.ago.net/learning.